Elaine, who was born and raised near Muscle Shoals, Alabama graduated from The Ohio State University in the early 80s with a BFA in Photography. In the intervening years, she has been a photo editor for a large publishing house specializing in text books, a small product photographer specializing in shooting three dimensional art, a cowgirl specializing in breeding and showing reining horses, a mother, specializing in raising two interesting kids from birth through college and a wife, specializing in putting up with a husband who wasn’t around enough. 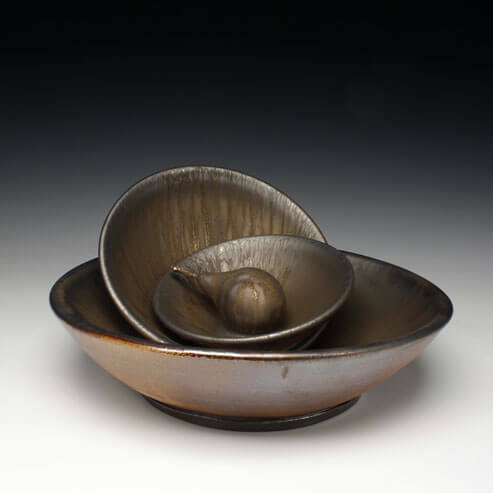 She recently returned to the ceramics studio after a 30 year absence and gratefully acknowledges the help of her potter husband who’s lately specializing in making up for lost time. Bob’s studio career has mostly gone to hell, having been in administration for a long time. Recently however, he’s been making a concerted, albeit sporadic, effort to revive it and his newest work represents the beginning of that commitment. Bob states, “I’ve always been a materials freak. My work is conceptually pretty simple and almost deliberately seeks to avoid any reference to contemporary ‘issues’. If there are any references at all, they are fairly pedestrian and limit themselves to functional pottery, everyday objects, landscape and geologic processes. I work in clay and y glaze because I believe they are incredibly rich materials that require a great degree of sophistication to manipulate with any degree of virtuosity. Clay isn’t for everyone. “There’s an analogy I think about which compares working with clay to riding a horse. It has to do with ego, imposition and sensitivity. To get it right, you have to find the right balance. If you’re trying to do something tricky on a horse, you had better find a way to communicate with the horse using its own language. You had better find a way to ‘ask’ the horse rather than ‘tell’ it. If you’re trying to do something tricky with clay, you had better listen to it and find a way to ‘hear’ what it’s telling you that day. Finding that elusive balance between imposing your will on an intelligent horse or on a lump of clay (which contains living micro organisms) and being sensitive to what they are willing to give you will usually land you in rarified air and result in something which could be transformational.